4102 Judson | LEASED in West University Place! 4102 Judson Avenue is a great rental in West University Place. This isn't your typical West University Cottage! 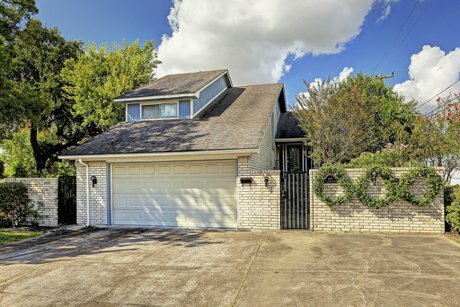 This updated one and a half story home has beautiful tile floors, a lushly landscaped backyard with a covered patio, a loft/game room and more! Raised entry has steps leading up to the loft/study/game room and steps leading down to the living and dining area. Beautiful tile floors in the living room, dining room, and kitchen. Living room has high vaulted ceilings and a fireplace. Large windows look overlook the gorgeous backyard and patio. Updated kitchen with high-quality stained wooden cabinets, stainless steel appliances, and granite counters. First floor master bedroom suite has two walk-in closets. Master bath has a seamless glass shower and an antique vanity. Loft area is designed as a study or game room. Two additional bedrooms off of the loft. Western bedroom has a south facing window. Eastern bedroom has a huge walk-in closet in addition to its regular closet. Backyard has lush landscaping, covered patio, two ceiling fans and an arbor. Great location close to neighborhood amenities such as Judson Park, tennis courts, Randalls, Walgreens, the Buffalo Grill, Bering's Hardware, and an Urgent Care Clinic.